Gripsweat - THUNDER 29 Minutes Later 6 Track 12" Vinyl! Record Store Day 2017 Release! New! 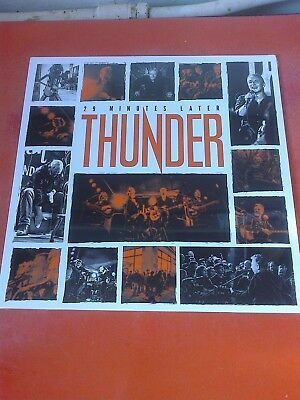 Thunder - 29 Minutes Later 6 track 12" vinyl. Record store Day 2017 release. New and sealed. If you have any questions please contact me and I will get back to you asap. I try to keep my postage and packing costs to a minimum but due to the price rises by Royal Mail here in the UK, I now have to charge as follows; If you are in the UK, please add £3 or £6.50 (Europe) and £9.50 (Rest Of The World). I sincerely apologize to any overseas buyers for this but I can offer a little CHEAPER POSTAGE by combining shipping for several items. Please message me for more information. Items will be sent in a padded envelope or cardboard mailer to ensure it gets to you securely. If you want the item sent by recorded or special delivery then email me for the cost. I AM HAPPY TO ACCEPT PAYPAL, cheques or money orders in GBP£ or email me for other forms of payment I accept. Please see my other listings for more THUNDER items and I can combine postage. Check out my excellent feedback record to bid with confidence. If you buy multiple items I can combine postage. Thanks for looking.